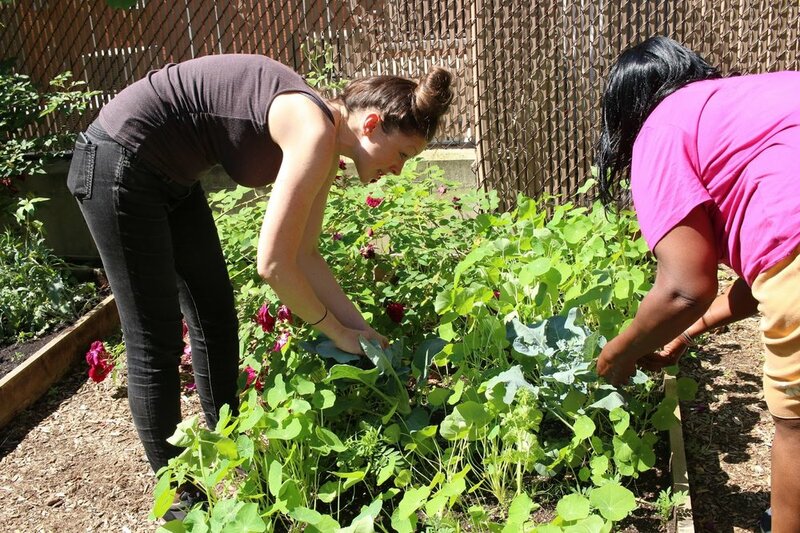 The Bridge's Urban Farming and Horticulture Program began as a small garden, intended to facilitate nutrition education and reduce client reliance on emergency food programs. Today, at five residences across the city and on the roof of our Clinical Headquarters on Manhattan's Upper West Side, Bridge clients grow everything from parsley to pumpkins. The gardening team visits Central Park's conservatory. Our farms and gardens are important activity sites for clients who seek to reduce stress and build confidence, improve their physical health through outdoor exercise, and connect with their environment as well as each other. Participants in the Urban Farming program take part in workshops, where they learn about the fruits, vegetables, and herbs they are growing and interesting ways to use that produce, including making healthy meals, teas, and lotions. Produce grown in the gardens is used in meals prepared for clients at our program locations. Part of The Bridge's Vocational Services program, our urban farms provide clients with skills, knowledge, and practical experience. Members of our Horticulture Team receive stipends for their work. Past participants have gone on to pursue jobs, credentials, and further education in horticulture. Urban farms reduce strain on the environment as well as food costs. Green spaces at our residences and Clinical HQ benefit all clients, not just program participants, supporting The Bridge's belief in integrating physical, social, and mental health to improve quality of life. The Urban Farm Manual was created during the development of The Bridge's first Urban Farm. We hope it will inspire, inform, and encourage others to create their own urban farms. The Bridge Horticulture and Urban Farms Program is undertaken in partnership with The Horticultural Society of New York (The Hort), and is made possible by the generous support of the Burpee Foundation, Con Edison, the Wells Fargo Foundation, Enterprise Community Partners, and the Inwood Charities Fund.